I have what you might call a road rage problem. This girl who normally will do just about anything to avoid confrontation somehow morphs into Lady Hulk Smash when ensconced behind the wheel of my Subaru. Rude, inattentive, and unsafe drivers are everywhere! (I want to add, “And it’s getting worse all the time!” but I’m aware how old and crotchety that makes me sound, so I’ll sneak it in here in a parenthetical so I can pretend like I’m not saying it.) I keep telling myself I need to stop being so surprised when other drivers are jerks, because a large percentage of my indignation stems from my disbelief that people can actually be so awful. If I just accepted that the vast majority of people, if given the choice, will act selfishly instead of unselfishly, then maybe I could release some of this anger. On the road, I aspire to weary resignation. At least then I could stop grinding my teeth. One of the ways I attempt to make my commute less soul-sucking is by listening to audio books in the car. 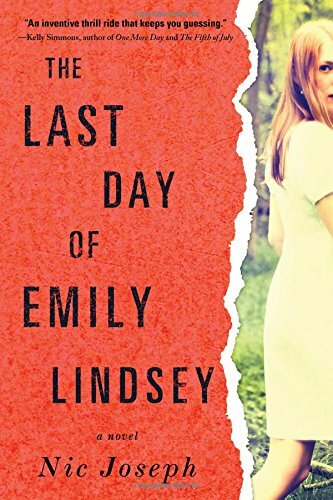 The Last Days of Emily Lindsey distracted me so well, I reached a state mellow enough that I didn’t even mind pulling up to that one really long stoplight right as it turned from yellow to red. Who cares if I had to sit there an extra three minutes (not that I’ve ever timed that light or have any knowledge of how much time I lose if I have to wait through an entire cycle)? That just meant I’d be three extra minutes closer to finding out what the heck was going on with the case. And the case is super strange! Alternating timelines can be tough to pull off, but this is one of the most effective uses I’ve seen. In the present, Steve is a cop who has struggled with nightmares and visions his entire life. Of course he has to keep them secret so he can stay on the job, but it’s tough to keep your problems quiet if you start blacking out at crime scenes. Steve and his partner are investigating a strange attack on an infamous gossip blogger named Emily Lindsey. She is found at her home, nearly catatonic and covered in someone else’s blood. She won’t respond to questioning, so Steve is on his own to try to figure out what happened to her. In the other (even weirder) timeline, a group of kids in a strange communal living situation hatch a plan to escape their rooms one night to uncover the truth about the odd place where they live. And eventually, yes, these two off-the-wall storylines come together, but not exactly how I expected, which was a fun surprise. If you like super suspenseful, edge-of-your-seat reads, I can’t think of a better book for you. It might even cure your road rage. TagsAudiobooks Still Count as Reading, Cops With Chips on Their Shoulders, Creepy Fall Reads, Dangerous Religion, Don't Drink the Kool-Aid, Nonlinear Storytelling, People Controlling People, Seemingly Disparate Threads Coming Together, You Think Your Childhood Was Screwed Up?